Review published in IJPE, Vol. 4, No. 2, April, 2008, p. 109. Engineering that has received attention just two decades back for the control of continuous production processes. EPC is a collection of techniques to manipulate the adjustable variable of the process to keep the output of the process as close to target as possible. Process capability represents the performance of a process when it is in a state of statistical control. The process spread is generally taken as a measure of the process capability and 99.74% of all products should lie within this spread, if the normality assumption is valid. In many situations we require to check if our existing process is capable of meeting certain product specifications. 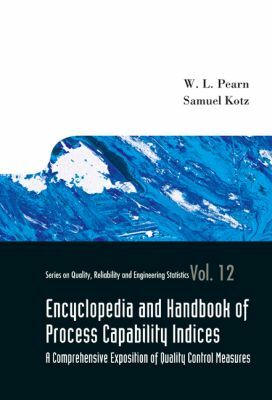 Such decisions are taken based on the Process capability indices (PCI) and naturally the book starts with the early process capability indices Cp and Cpk and goes about defining and explaining the development of the recent process capability indices (CPIs) and their uses. The authors provide a very useful Bibliography arranged alphabetically by the first author's name which contains a voluminous listing of 474 publications but it would have been better, if they had arranged these chronologically and used Vancouver style of citation. This would have been more meaningful and necessary to appreciate how the development in the area of process capability has taken place in past 20 years. The book contains 64 papers and reports from the first author which of course as claimed in Introduction of the book, makes the foundation of Chapters 9-16 whereas the material presented in chapter 1-8 is supposed to be standard. In over all assessment, this book is unique and will be found very useful for industries and research organizations concerned with the process control. Review published in the International Journal of Performability Engineering, Vol. 4, No. 2, April 2008, p. 109.